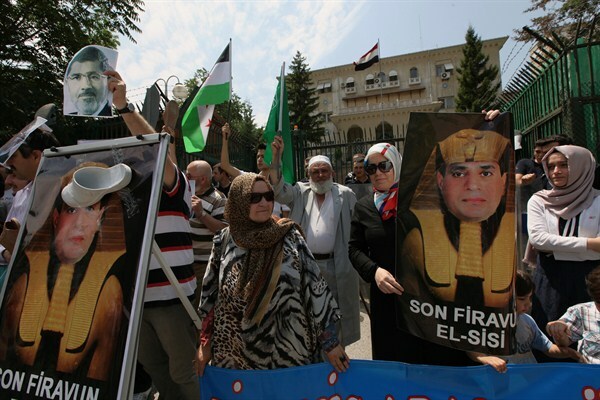 Turkish supporters of former Egyptian President Mohammed Morsi protest with a portrait of current Egyptian President Abdel Fattah el-Sissi, depicted as the "last pharaoh," Ankara, Turkey, July 13, 2013 (AP photo by Burhan Ozbilici). Egypt and Turkey, two of the Middle East’s largest and most influential states, have developed diametrically opposed foreign policies since downgrading their diplomatic ties four years ago. With leaders in both countries continuing to consolidate power domestically, the region should brace for the impact of competing influences in the power struggle between Cairo and Ankara. In an email interview, Yasser El Shimy, adjunct professor at George Washington University in Washington D.C., discusses the evolution of Egypt-Turkey ties, how their foreign policies have become increasingly competitive, and what outside forces have done to exacerbate tensions.